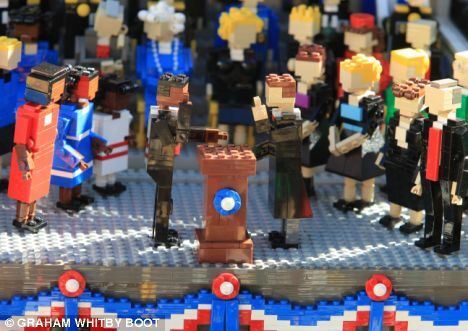 Starting today, visitors to Legoland California can witness the inauguration of Barack Obama depicted in Lego bricks. Hundreds of Legoland mini-figures, including President Bush, two ex-Presidents, and other celebrities, are also part of the ceremony on the Capitol steps. Among the four-inch-tall mini Lego guests: President George Bush, Oprah, Aretha Franklin, California Senator Dianne Feinstein. More than 1000 mini-figures created out of thousands of Lego bricks were used to create the one-of-a-kind scene. …The builders even thought of the porta-potty area where the public waits in line. And there’s a CNN video interview with the designer. The UK’s Dail Mail has a very good article and another bunch of good close-ups. Legoland model builder Kristi Klein helped with the exhibit. She has a blog. The real U.S. Capitol is 288 feet tall. The Capitol in Miniland U.S.A. is seven feet tall. This entry was posted in Heard Online, Like Show Business and tagged Legos by Mike Glyer. Bookmark the permalink.